Following the conclusion of Black Canary’s first arc, the rock band has lost its lead singer and guitarist, forcing the remaining members to take action if they want to save their group. This week’s Black Canary #8 finds Paloma, Byron, and Heathcliff traveling to Berlin to track down Dinah “D.D.” Lance, who is dealing with her own considerable troubles as she fends off attackers for the viewing pleasure of a mysterious new enemy. It’s another fun, strange set-up from writer Brenden Fletcher, who has done great work blending band drama with superhero spectacle on this title, and his unconventional take on superhero narratives is reflected in the artists on this book. Regular artist Annie Wu is taking a break after delivering some incredible visuals in the last issue, including a fight scene set on a music staff that has been the highlight of the entire series. But Sandy Jarrell is a fitting replacement, with a similar rendering style that makes the transition between artists very smooth. Jarrell has already worked on Black Canary, so he understands the tone and the look of the characters. His art blends wonderfully with Lee Loughridge’s coloring, which has elevated the book with bold palettes that use a specific dominant shade to set the atmosphere. 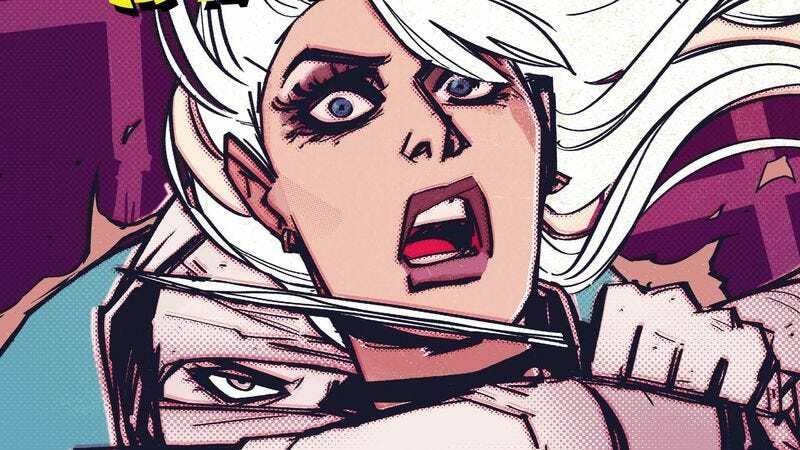 This preview provides a small tease of the action waiting for the band in Berlin, and if past issues are any indication, the stakes will only get higher as D.D.’s band mates swoop in to save her.